It lay under the bushes motionless for a while. It liked the feel of the cold dirt under its body. Things suddenly seemed to make sense. She had come out of fear. She had probably feared the beast would come seeking out her father and kill him if she did not come. Now that she knew what a soft hearted creature it was, she had gone back reassured that it would cause no harm to her and her family. How wicked! How cruel! How she had cheated it! Should it go after her and kill her and her family? The minute the thought of hurting her came in its head, its mind was filled with revulsion and self-loathing. “What a terrible creature am I? I am a horrible beast not only in body but in mind as well. Otherwise how would have I even entertained the thought of hurting my dear angel? I think I got what I deserved. It was all my fault right from the beginning. What I demanded of the merchant was not at all fair. What a terrible price he had to pay for a night’s boarding and lodging and a single rose! Who but a monster could have demanded such a thing? When I saw him hesitate, without paying the slightest heed to a father’s emotions, I used life threats to enforce my demand. " Its mind was filled with a calm serenity. The ground was feeling increasingly alluring. It wanted to be one with the soil. It had completely lost its desire to live. Death would only be the most welcome release from this miserable existence. In some ways, it reflected on the poetic justice of the whole thing. It was fitting that its life would end under this very rose bush where this whole series of events had begun. Three young girls in their twenties chased each other around the garden. All of them wore similar satin gowns and had similar golden curls and cheeks red like apples. A distant observer would have found it difficult to distinguish one from the other. However a more subtle observer would have noticed, the younger one’s features were more delicate, her manner a little bit more graceful and her eyes a bit more soulful. Though she had a smile on her face and no care in life to all external appearances, something kept disturbing her in the depth of her mind. She had not kept the promise to the beast. She had promised to return within two weeks. It was six weeks now. She wondered what the beast must be thinking. But her sister would not let her go. “We are seeing you after more than a year. How can you leave us and go so soon. We have missed you so much. Please stay for a few more days with us,” they had said. She had stayed on for a couple of weeks. Then her father had fallen sick and she had to care for him. By the time their father had recovered, it was just a week from the country fair. The father as well as the two sisters had said, “Dear Belle, how you used to enjoy the fair. Last year you had to miss it. We don’t know if you will even see the fair again in your life. You are anyway delayed by five weeks. What difference will one more week make. Stay and see the fair and go.” She had lovely memories of the fair and was tempted. She told herself firmly that she would leave immediately after the fair. The fair was to happen the next day. Her face clouded. Her sister had asked the very question that had been plaguing her mind. She became very thoughtful. All attempts by her father and sister to cheer her up were to no avail. She kept asking herself if she could ever love a beast. Like every girl of her age she had dreamt of a prince charming who would come riding on a horse and take her away. She had reconciled herself to the fact that there would be no prince charming in her life. But could she spend the rest of her life with an ugly beast? 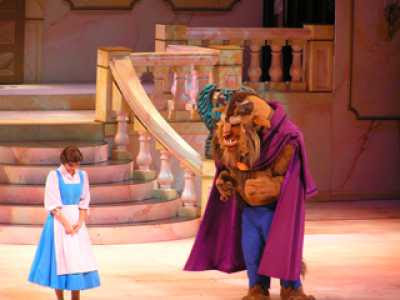 The beast had always been so attentive to her needs. She sometimes felt she could see love in its eyes. She was fond of it. She respected it. She felt sorry for it. But the question was would she ever be able to love it? Slowly its vision was dimming and it felt peace descend upon it. The pain also seemed to reduce and then everything went dark. It did not know how much time passed for it was now beyond the confines of space and time. But it again felt pain returning and thoughts seem to be entering back into its head. It felt something soft below its head and felt oddly pleasant. It slowly opened its eyes and its eyes looked straight into the face of the angel of its dreams. Is this what they called after life? It had often wondered what happened to beasts after death? Whatever this was, it felt good. It was back with Belle and that was all that mattered. It wanted to make the moment last for eternity. The beast could not believe its ears. She had rarely ever expressed her emotions to him before. She had always seemed polite and distant. But there was still more in store. The last words reverberated in its ears. It felt something strange happening to it. It felt as if an electric shock was going through its entire body. The body convulsed and it shook and it shivered. Its whole essence seemed to be pulled apart. Slowly it found its thinking was becoming clearer and the entire bestial rage seemed to have disappeared in a trace. “Who are you?” yelled Beauty and jumped up letting its head hit the floor with a thud. It picked himself up and looked at itself. It was no longer a beast. He was now a man. He wore robes fit for a king. He lifted up his hands and examined them. The smooth skin sparked like pearls. His old memories came flooding back to him. He had been a prince. He had killed an old druid in love play with his consort in beast form during a hunt. The druid’s wife had cursed him in rage and transformed him into a beast. But the good druid even in his dying breath had given him a benefaction to mitigate the curse. “Thou shalt remain a beast only till the day thine heart shalt true love know.” He had gone many years without finding true love and slowly the beast nature had begun to assert itself taking over his human nature. He had begun to lose all his memories and only the rare company of humans like the merchant served to help him hold on to some last shreds of humanity. But his soul had continued to yearn for love and he had finally found it. He looked at Belle standing front of him gazing at him with her almond eyes. Shock had given way to awe and she was surveying him from head to foot. He would still have to explain everything to her. But they still had a life time together for all explanations. I love this Fairy Tale & of course the Disney movie. Yeah - that is the whole idea of fairy tale. But we can try to use the concept and try to make it more real like.